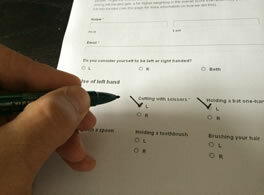 We have been running a major survey over the past year finding out about young left-handers’ experiences at school and whether they are getting the help and advice they need or just being left to cope with right-handed tools and equipment as best they can. The results are fascinating and show there is still a very long way to go to get equal teaching in the basics for a lot of left-handed children and that many teachers are nowhere near as well informed as we had hoped about the small things they can do to help their left-handed students. 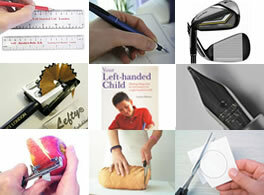 There is a full analysis of the results on the special site we created for issued related to left-handed children. In school the teachers never really cared what hand I wrote with or cut paper with. Especially in P.E. class. The teacher just assumed that I was right handed so I had to learn to use my right hand. I am now ambidextrous but I still had to work on using my right hand. It was difficult but I learned. I think teachers could use a little more guidance in helping left handers. When I was in school (junior high) I had to deal with the dreaded spiral notebooks & my teachers complained that I left too big of a gap from the margin line, so I was getting points knocked off for that thus lowering my grade. Then I figured out that I could flip my notebook over and write from the end of the spiral notebook to the front. My teachers started complaining (again) how I was writing on the wrong side of the page. Finally, I couldn’t take it any longer & went crying to my mom. She made an appt. met w/ my teachers (all 6 of them) & told them point blank, “My daughter is left handed, why is she being treated differently than those who are right? If she wants to write on the wrong side of her paper, let her.” My mother went on to say that I was being discriminating against & if it continued, needless to say to it would not end pretty for the school. After that, I didn’t have any more problems. I was forced to STOP using my left hand by the second grade teacher in a farming community. She was the wife of the principal. I started writing with my left hand. I never learned baseball so those questions should be rephrased. I would catch balls (and other objects) with either hand! My survey score was 39% today. I was also in a MVA where I lost ROM in my left elbow AND wrist.